There is a classic image of a solitary man who has spent all winter tying his own flies venturing hip-deep into icy early April waters in pursuit of the trout of his dreams. Fishing is indeed a passion for many, but the sport is also an ideal activity for regular dads, moms and kids. In fact, women hold the state records for both smallmouth bass and brown trout, both out of Round Valley Reservoir in Hunterdon County. And, of course, kids and fish go way, way back. Kids sometimes have an uncanny intuition about what will work with fish. At the very least a family fishing trip will get you close to the marvelous waterways of the Skylands; and close to each other. Initially, you have to decide what type of fish you want to catch-trout, small or large mouth bass, shad, walleye, lake trout, muskellunge, striped bass- then study maps, guide and travel books, and fishing books and magazines to learn what type of equipment (rods, reels, baits) you'll need to attract these fish. If you live in the area, many local sporting goods stores sponsor talks and slide shows by resident gurus who know exactly where to throw the bait. Of course you'll need your fishing license, and you should consider optional equipment like a vest, a tackle box, waders or hip boots, some good sunglasses and a cap. Faith Stephany landed this 7lb 6oz giant of a fish, her first trout ever, on her second cast into the Paulins Kill. She came into the Knot Just Flies tackle and bait shop, on the streambank in Blairstown, with her boyfriend to buy her first fishing license an hour before. If you're planning to fish some of the larger lakes or reservoirs, like Round Valley and Spruce Run in Hunterdon County, Merrill Creek Reservoir in Warren County, or Lake Hopatcong bordering Morris & Sussex Counties, get ready for some major bodies of water. You'll catch fine fish from the embankments at these impoundments, but if you're looking for larger game fish like lake trout or northern pike which can run up to 30 lbs. you'll probably want to get offshore in a boat, where you can get to the real deep water. You can also get into real deep trouble on these expanses of water if you aren't prepared. And make sure that it is not possible that you will encounter a life-threatening storm. Some reservoir fishermen recommend downriggers-- devices that enable you to present your bait at various, deeper water levels-- but you can still catch fish without them. If you have brought adequate supplies your trip will be wonderful. Opening day at Saxton Falls. Some anglers prefer to hike back into the woods with minimal ultra-light gear, a box of worms, and a couple of cold drinks to relax and enjoy the day. Places like the Black River, the Paulinskill, the Delaware at Bulls Island State Park near Stockton and the Rockaway in Morris County leave lots of fond memories. When you trout fish you're right down in there in the water, able to hear the onrushing stream which acts as a sort of soothing, cleansing tonic, washing away all cares and worries. Alone on the Black River near Hacklebarney State Park or on the Musconetcong River in Warren County near Asbury's old graphite mill... well, it's hard to put this experience into words. How about;.. pure fun? Fly fishing for trout near the historic Red Mill on the South Branch in Clinton is every fisherman's dream. Beautiful setting and great fish. Another great spot for fly fishing in Hunterdon is deep in the woods at the now famous Ken Lockwood Gorge. "The Gorge", as its known to fly fishers who've casted here, presents one of the Skylands' (if not the state's) most picturesque setting for trying your luck. This spot is for fly casters only, so brush up on your skills and take the leap, you won't regret traveling down this rocky road in Lebanon Township that leads to Mecca. Then there's the Big Flatbrook River which runs from northern Sussex County's Stokes State Forest along the western slopes of the Kittatinny Mountains all the way down to Flatbrookville, where it empties into the Delaware River. About 25 miles long, the river faces some of the highest country in New Jersey, passing from High Point (1803 feet) south, under points that rise between 1500 and 1600 feet. 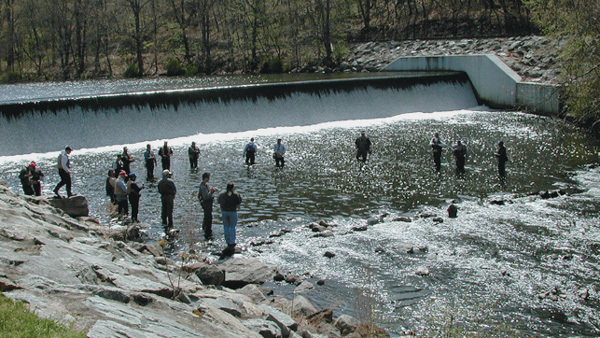 The mountains and valley forged by the river create panoramic, unspoiled vistas not normally associated with our fair state, and the Flatbrook is the finest trout fishing stream New Jersey has to offer. 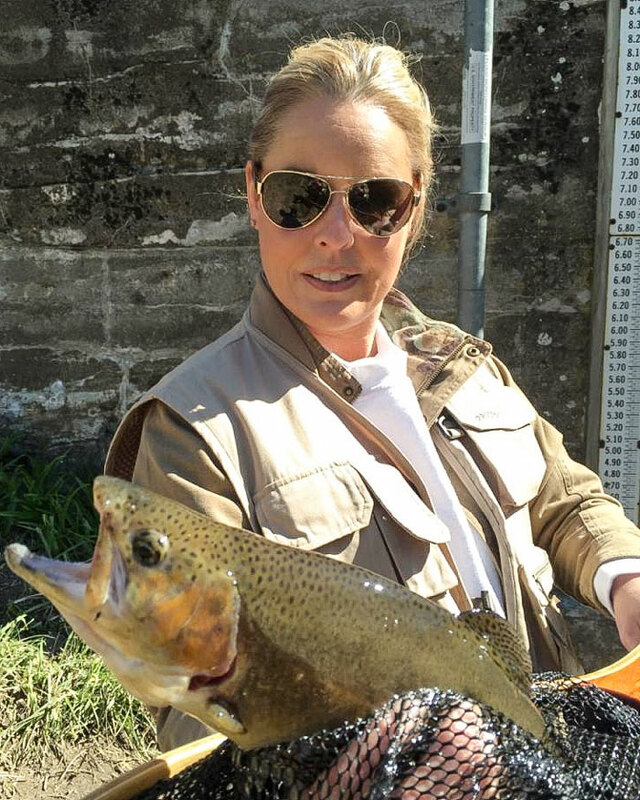 The Pequest River, another splendid trout spot in Warren County offers a special treat at the Pequest Trout Hatchery where you can learn about how sac-fry turn into rainbows, browns, and brookies. The Hatchery has tours and videos that explain everything about these elusive salmonoids and large holding tanks with some very large trout. Although some fishermen prefer a vigorous hike into the woods, others prefer a more leisurely approach to fishing. There are scores of small accessible lakes in Sussex County which offer great bass fishing in the heat of summer. Worms can be a beginner's (or anyone's, for that matter) best bait. If it catches fish, anything goes; from glowing rubber worms to spinner, power baits (artificial fish attractants sold commercially), and larger artificial lures. For me, live bait always works, so try buying (or netting your own) small baitfish like herring when fishing the larger bodies of water. Live hellgrammites really do the trick in the Delaware, but can be costly. The true test of a dedicated fisher comes when its time to put a hellgrammite on a hook- they are not pretty creatures, and they pinch! This is where a guide really comes in handy. 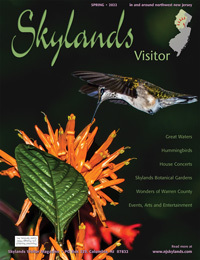 The waterways of the Skylands have provided fishers with no less than 20 state records. But remember, thinking only about landing the biggest and the best doesn't always make for the best outing. Being with friends and family, enjoying all the beauty mother nature has to offer, exploring the woods, streams, rivers, and lakes for wildlife and wild flowers... this is the experience that resonates, long after the last fish has been put on your stringer. If you're serious about coming home with food for a week or something for over the mantle, a good guide can be a real plus on a fishing trip, especially if you're not too familiar with a waterway. Guides are especially helpful on the Delaware River when looking for shad, smallmouth bass and the prized muskellunge, the giant bounty that patrols the depths of the river. Pequest Trout Hatchery and Natural Resource Education Center is located on a tract of more than 1600 acres off Route 46 west of Hackettstown near the town of Oxford in Warren County. Each year Pequest provides over 600,000 brook, brown and rainbow trout for the angling public in over 200 bodies of water open to public fishing. Each fall over 2 million eggs are collected from the hatchery's own broodstock of 6000 two and three year old trout . After being fertilized the eggs are brought to the Nursery Building, incubated and nurtured to hatching 28 to 35 days later. The fingerling trout move to outdoor raceways by spring where they live for a year feeding on special formula. Beginning in March, the 1 1/2 year old trout are loaded into stocking trucks and taken to lakes and rivers throughout New Jersey. The raceways are drained, cleaned and refilled with water to await another generation of trout from the Nursery. Pequest Hatchery is open seven days a week from 10am-4pm for self-guided tours of the hatchery facilities, exhibits and displays. There are hiking trails, picnic grounds and educational seminars as well. For information call 908-637-4125. For the sake of the fish and fishers, residents and visitors must follow the rules for fishing in New Jersey. According to Carol Colao, Communications Staff Member at the Law Enforcement Office of the New Jersey Division of Fish, and Wildlife in Clinton, fishermen need to have a license and read the rules in the Fish and Wildlife Digest. "You have to check the digest because there are certain restrictions in certain areas," she explains. "Take stocking for instance. You can fish in certain streams on stocking days and in other streams you can't. In terms of boat fishing, all passengers must wear life jackets and the boat, if it has a motor, must be registered with the Division of Motor Vehicles. You must abide by the marine regulations. Our Fish and Game officers actively patrol during the fishing seasons." 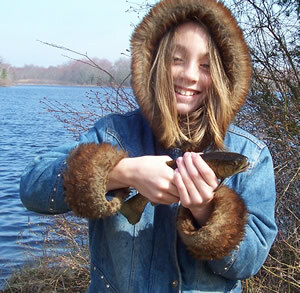 Visit the NJ Division of Fish and Wildlife for current license fees and regulations. And don't forget that April 6 is the opening day for trout season in 2019.